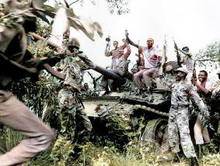 Guerrilla forces of the Sudan People's Liberation Army celebrate over a disabled tank. The Sudanese war is often characterized as a fight between the central government expanding and dominating peoples of the periphery, raising allegations of marginalization. Kingdoms and great powers based along the Nile River have fought against the people of inland Sudan for centuries. Since at least the 18th century, central governments have attempted to regulate and exploit the undeveloped southern and inland Sudan. Some sources describe the conflict as an ethnoreligious one where the Muslim central government's pursuits to impose sharia law on non-Muslim southerners led to violence, and eventually to the civil war. Douglas Johnson has pointed to an exploitative governance as the root cause. When the British governed Sudan as a colony they administered the northern and southern provinces separately. The south was held to be more similar to the other east-African colonies — Kenya, Tanganyika, and Uganda — while northern Sudan was more similar to Arabic-speaking Egypt. Northern Arabs were prevented from holding positions of power in the south with its African traditions, and trade was discouraged between the two areas. However, in 1946, the British gave in to northern pressure to integrate the two areas. Arabic was made the language of administration in the south, and northerners began to hold positions there. The southern elite, trained in English, resented the change as they were kept out of their own government. After decolonization most power was given to the northern elites based in Khartoum, causing unrest in the south. The British moved towards granting Sudan independence, but they failed to give enough power to Southern leaders. Southern Sudanese leaders weren't even invited to negotiations during the transitional period in the 1950s. In the post-colonial government of 1953, the Sudanization Committee only included 6 southern leaders, though there were some 800 available senior administrative positions. The second war was partially about natural resources. Between the north and the south lie significant oil fields and thus significant foreign interests (the oil revenue is privatized to Western interests as in Nigeria). The north wanted to control these resources because they are situated on the edge of the Sahara desert, which is unsuitable for agricultural development. Oil revenues make up about 70% of Sudan's export earnings, and contribute to the development of the country which, unlike the south, does not depend on international aid. Due to numerous tributaries of the Nile river and heavier precipitation in the south of Sudan they have superior water access and fertile land. There has also been a significant amount of death from warring tribes in the south. Most of the conflict has been between Nuer and Dinka but other ethnic groups have also been involved. These tribal conflicts have remained after independence. For example, in January 2012 3,000 Murle people were massacred by the Nuer. The first civil war ended in 1972, with the Addis Ababa Agreement. Part of the agreement gave religious and cultural autonomy to the south. The Addis Ababa Accords were incorporated in the Constitution of Sudan; the violation of the agreement led to the second civil war. The first violations occurred when President Jaafar Nimeiry attempted to take control of oil fields straddling the north-south border. Oil had been discovered in Bentiu in 1978, in southern Kurdufan and Upper Blue Nile in 1979, the Unity oilfields in 1980 and Adar oilfields in 1981, and in Heglig in 1982. Access to the oil fields meant significant economic benefit to whoever controlled them. Islamic fundamentalists in the north had been discontented with the Addis Ababa Agreement, which gave relative autonomy to the non-Islamic majority Southern Sudan Autonomous Region. The fundamentalists continued to grow in power, and in 1983 President Nimeiry declared all Sudan an Islamic state, terminating the Southern Sudan Autonomous Region. The Sudan People's Liberation Army (SPLA) was founded in 1983 as a rebel group, to reestablish an autonomous Southern Sudan by fighting against the central government. While based in Southern Sudan, it identified itself as a movement for all oppressed Sudanese citizens, and was led by John Garang. Initially, the SPLA campaigned for a United Sudan, criticizing the central government for policies that were leading to national "disintegration". In September 1985 announced the end of the state of emergency and dismantled the emergency courts but soon promulgated a new judiciary act, which continued many of the practices of the emergency courts. Despite Nimeiry's public assurances that the rights of non-Muslims would be respected, southerners and other non-Muslims remained deeply suspicious. On 6 April 1985, senior military officers led by Gen. Abdul Rahman Suwar ad-Dahhab mounted a coup. Among the first acts of the new government was to suspend the 1983 constitution, rescind the decree declaring Sudan's intent to become an Islamic state, and disband Nimeiry's Sudan Socialist Union. However, the "September laws" instituting Islamic Sharia law were not suspended. A 15-member transitional military council was named, chaired by Gen. Suwar ad-Dahhab, in 1985. In consultation with an informal conference of political parties, unions, and professional organizations—known as the "Gathering"—the military council appointed an interim civilian cabinet, headed by Prime Minister Dr. Al-Jazuli Daf'allah. Elections were held in April 1986, and a transitional military council turned over power to a civilian government as promised. The government was headed by Prime Minister Sadiq al-Mahdi of the Umma Party. It consisted of a coalition of the Umma Party, the Democratic Unionist Party (DUP) (formerly the NUP-National Unionist Party), the National Islamic Front (NIF) of Hassan al-Turabi, and several southern region parties. This coalition dissolved and reformed several times over the next few years, with Prime Minister Sadiq al-Mahdi and his Umma Party always in a central role. In May 1986, the Sadiq al-Mahdi government coalition began peace negotiations with the Sudan People's Liberation Army (SPLA) led by Col. John Garang. In that year the SPLA and a number of Sudanese political parties met in Ethiopia and agreed to the "Koka Dam" declaration, which called for abolishing Islamic Sharia law and convening a constitutional conference. In 1988, the SPLA and the DUP agreed on a peace plan calling for the abolition of military pacts with Egypt and Libya, freezing of Sharia law, an end to the state of emergency, and a cease-fire. However, during this period the second civil war intensified in lethality, and the national economy continued to deteriorate. When prices of basic goods were increased in 1988, riots ensued, and the price increases were cancelled. When Prime Minister Sadiq al-Mahdi refused to approve a peace plan reached by the Democratic Unionist Party (DUP) and the Sudan People's Liberation Army (SPLA) in November 1988, the DUP left the government. The new government consisted essentially of the Umma Party and the fundamentalist National Islamic Front (NIF). In February 1989, the army presented Prime Minister Sadiq al-Mahdi with an ultimatum: he could move toward peace or be removed. He chose to form a new government with the DUP, and approved the SPLA/DUP peace plan. A constitutional conference was tentatively planned for September 1989. On 30 June 1989, however, military officers under then Col. Omar Hassan al-Bashir, with National Islamic Front (NIF) instigation and support, replaced the Sadiq al-Mahdi government with the Revolutionary Command Council for National Salvation (RCC), a military junta of 15 military officers (reduced to 12 in 1991) assisted by a civilian cabinet. As General al-Bashir he became: president; chief of state; prime minister; and chief of the armed forces. The RCC al-Bashir military government banned trade unions, political parties, and other "non-religious" institutions. About 78,000 members of the army, police, and civil administration were purged in order to reshape the government. In March 1991, a new penal code, the Criminal Act of 1991, instituted harsh punishments nationwide, including amputations and stoning. Although the southern states were officially exempt from these Islamic prohibitions and penalties, the 1991 act provided for a possible future application of Islamic Shari’a law in the south. In 1993, the government transferred most non-Muslim judges from the south to the north, replacing them with Muslim judges in the south. The introduction of Public Order Police to enforce Shari’a law resulted in the arrest, and treatment under Shari’a penalties, of southerners and other non-Muslims living in the north. The Sudan People's Liberation Army (SPLA) was in control of large areas of Equatoria, Bahr al Ghazal, and Upper Nile provinces and also operated in the southern portions of Darfur, Kordofan, and Blue Nile provinces. The government controlled a number of the major southern towns and cities, including Juba, Wau, and Malakal. An informal cease-fire in May broke down in October 1989. In July 1992, a government offensive seized southern Sudan, and captured the SPLA headquarters in Torit. Both the government regular armed forces and notorious militia (known as the People's Defense Forces, PDF) were used to attack and raid villages in the South and the Nuba Mountains. Sudan’s national governments have a long history of using proxies in Southern Sudan, and the North–South border areas, to fight their wars and preserve their regular forces. These militias were recruited locally, and with covert ties to the national government. Many of the Khartoum-aligned groups were created and then armed by the NIF in a deliberate ‘divide and rule’ strategy. In August 1991, internal dissension among the rebels led opponents of Colonel Garang's leadership of the SPLA to form the so-called Nasir faction of the SPLA rebel army. The attempt to overthrow Garang was led by Riek Machar and Lam Akol. In November 1991, SPLA-Nasir carried out the Bor massacre, killing an estimated 2000 civilians. In September 1992, William Nyuon Bany formed a second rebel faction, and in February 1993, Kerubino Kwanyin Bol formed a third rebel faction. On 5 April 1993, the three dissident rebel factions announced a coalition of their groups called SPLA United at a press conference in Nairobi, Kenya. In 1990–91, the Sudanese government supported Saddam Hussein in the Gulf War. This changed American attitudes toward the country. Bill Clinton's administration prohibited American investment in the country and supplied money to neighbouring countries to repel Sudanese incursions. The US also began attempts to "isolate" Sudan and began referring to it as a rogue state. Since 1993, the leaders of Eritrea, Ethiopia, Uganda, and Kenya have pursued a peace initiative for Sudan under the auspices of the Intergovernmental Authority on Development (IGAD), but results have been mixed. Despite that record, the IGAD initiative promulgated the 1994 Declaration of Principles (DOP) that aimed to identify the essential elements necessary to a just and comprehensive peace settlement; i.e., the relationship between religion and the state, power-sharing, wealth-sharing, and the right of self-determination for the south. The Sudanese Government did not sign the DOP until 1997 after major battlefield losses to the SPLA. In 1995, the opposition in the north united with parties from the south to create a coalition of opposition parties called the National Democratic Alliance. This development opened a northeastern front to the civil war, making it more than before a center-periphery rather than simply a north-south conflict. The SPLA, DUP, and Umma Parties were the key groups forming the NDA, along with several smaller parties and northern ethnic groups. In 1995, Eritrea, Ethiopia and Uganda stepped up their military assistance to the SPLA to the point of sending active troops into Sudan. Eritrean and Ethiopian military involvement weakened when the two countries entered a border conflict in 1998. Uganda's support weakened when it shifted its attention to the conflict in the Democratic Republic of Congo. By 1997, seven groups in the government camp, led by former Garang lieutenant Riek Machar, signed the Khartoum Peace Agreement with the NIF, thereby forming the largely symbolic South Sudan Defence Forces (SSDF) umbrella. Furthermore, the government signed the Nuba Mountains, and Fashoda agreements with rebel factions. These included the Khartoum agreements that ended military conflict between the government and significant rebel factions. Many of those leaders then moved to Khartoum where they assumed marginal roles in the central government, or collaborated with the government in military engagements against the SPLA. These three agreements paralleled the terms and conditions of the IGAD agreement, calling for a degree of autonomy for the south and the right of self-determination. Nevertheless, the SPLA made major advances in 1997 due to the success of Operation Thunderbolt, an offensive during which the South Sudanese separatists seized most of Central and Western Equatoria from the government. In July 2000, the Libyan/Egyptian Joint Initiative on the Sudan was made moot, calling for the establishment of an interim government, power-sharing, constitutional reform, and new elections. Southern critics objected to the joint initiative because it neglected to address issues of the relationship between religion and the state and failed to mention the right of shelf-determination. It is unclear to what extent this initiative will have a significant impact on the search for peace, as some critics view it as more aimed at a resolution among northern political parties and protecting the perceived security interests of Egypt in favour of the unity of the Sudan. Peace talks between the southern rebels and the government made substantial progress in 2003 and early 2004, although skirmishes in parts of the south continued. A Comprehensive Peace Agreement was signed on 9 January 2005 in Nairobi. The south had autonomy for six years, followed by a referendum on independence (the Southern Sudanese independence referendum, 2011). Both sides of the conflict would have merged portions of their armed forces into a 39,000-strong force after six years (the Joint Integrated Units), if the Southern Sudanese independence referendum had turned out against secession. Oil revenues were divided equally between the government and SPLA during the six-year autonomy period. Jobs were split according to varying ratios (central administration: 70 to 30, Abyei/Blue Nile State/Nuba Mountains: 55 to 45, both in favour of the government). The status of three central and eastern provinces was a point of contention in the negotiations. In 1999, Egypt and Libya initiated the Egypt-Libya Initiative (ELI). By this time the peace process of the Inter-Governmental Authority on Drought and Development (IGADD) had reached a stalemate. ELI's main purpose had been to bring members of the non-Southern opposition (especially opposition in the north) aboard the talks. However, as ELI avoided contentious issues, such as secession, it lacked support from the SPLA, but the NDA leadership accepted it. By 2001, ELI had been unable to bring about any agreement between the parties. In September 2001, former U.S. Senator John Danforth was designated Presidential Envoy for Peace in the Sudan. His role was to explore the prospects that the US could play a useful catalytic role in the search for a just end to the civil war, and enhance humanitarian services delivery that can help reduce the suffering of the Sudanese people stemming from war related effects. Following an internal outcry, the Sadiq al-Mahdi government in March 1989 agreed with the United Nations and donor nations (including the US) on a plan called Operation Lifeline Sudan (OLS), under which some 100,000 tons of food was moved into both government and SPLA-held areas of the Sudan, and widespread starvation was averted. Phase II of OLS to cover 1990 was approved by both the government and the SPLA Sudan faced a 2-year drought and food shortage across the entire country. The US, UN, and other donors attempted to mount a coordinated international relief effort in both north and south Sudan to prevent a catastrophe. However, due to Sudan's human rights abuses and its pro-Iraqi stance during the Gulf War, many donors cut much of their aid to the Sudan. In a similar drought in 2000–01, the international community again responded to avert mass starvation in the Sudan. International donors continue to provide large amounts of humanitarian aid to all parts of the Sudan. The US government's Sudan Peace Act of 21 October 2002 accused Sudan of genocide for killing more than 2 million civilians in the south during the civil war since 1983. Sudan relied on a variety of countries for its arms supplies. Following independence, the army was trained and supplied by the British. However, after the 1967 Six-Day War, relations were cut off, as were relations with the United States and West Germany. From 1968 to 1972, the Soviet Union and COMECON nations sold large numbers of weapons and provided technical assistance and training to Sudan. At this time the army grew from a strength of 18,000 to roughly 50,000 men. Large numbers of tanks, aircraft, and artillery were acquired, and they dominated the army until the late 1980s. Relations cooled between the two sides after the coup in 1972, and the Khartoum government sought to diversify its suppliers. The Soviet Union continued to supply weapons until 1977, when their support of Marxist elements in Ethiopia angered the Sudanese sufficiently to cancel their deals. The People's Republic of China was the main supplier in the late 1970s. Egypt was the most important military partner in the 1970s, providing missiles, personnel carriers, and other military hardware. At the same time military cooperation between the two countries was important. 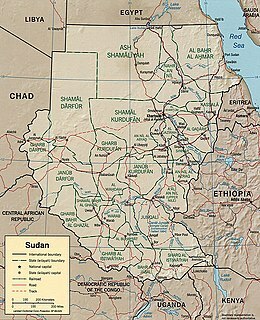 U.S.-aligned countries resumed supplying Sudan in the mid-1970s. The United States began selling Sudan a great deal of equipment around 1976, hoping to counteract Soviet support of Marxist Ethiopians and Libyans. Military sales peaked in 1982 at US$101 million. West Germany established an ammunitions factory in Khartoum and introduced vast quantities of automatic small arms to Sudan. After the start of the second civil war, American assistance dropped, and was eventually cancelled in 1987. In November 1993, Iran was reported to have financed Sudan´s purchase of some 20 Chinese ground-attack aircraft. Iran pledged $17 million in financial aid to the Sudanese government, and arranged for $300 million in Chinese arms to be delivered to the Sudanese army. Meanwhile, the rebel SPLA was supplied weapons through or by Eritrea, Ethiopia, and Uganda. The Israeli embassy in Kenya also supplied anti-tank missiles to the rebels. Armies from all sides enlisted children in their ranks. The 2005 agreement required that child soldiers be demobilized and sent home. The SPLA claimed to have let go 16,000 of its child soldiers between 2001 and 2004. However, international observers (UN and Global Report 2004) have found demobilized children have often been re-recruited by the SPLA. As of 2004, there were between 2,500 and 5,000 children serving in the SPLA. Rebels have promised to demobilize all children by the end of 2010. The goal was met. The Nuer White Army, a minor participant in the war in the Greater Upper Nile region, consisted largely of armed Nuer youths, but it was principally self-organised and often operated autonomously of both elders' authority and the dictates of the major factions. ^ a b c d Prunier (2004), p. 377. ^ Prunier (2009), p. 82. ^ a b Leopold (2001), pp. 99–100. ^ Prunier (2004), pp. 376–377. ^ Prunier (2009), pp. 74, 82. ^ Connell (1998), p. 55. ^ a b de Waal (2007), p. 12. ^ Dixon, Jeffrey S., and Meredith Reid Sarkees. A Guide to Intra-state Wars an Examination of Civil, Regional, and Intercommunal Wars, 1816-2014, p. 392. Los Angeles, CA: Sage Reference, 2016. ^ Bassil (2013), p. 169. ^ Bassil (2013), pp. 168–169. ^ Plaut (2016), p. 77. ^ a b Vuylsteke (2018), p. 6. ^ Plaut (2016), pp. 77–78. ^ Prunier (2009), p. 75. ^ "Military Support for Sudanese Opposition Forces." Sudan. Retrieved 6 January 2016. ^ DeRouen, Karl R. (2007). Civil wars of the world: major conflicts since World War II. ABC-CLIO. p. 742. ^ Sudan: Nearly 2 million dead as a result of the world's longest running civil war, U.S. Committee for Refugees, 2001. Archived 10 December 2004 on the Internet Archive. Retrieved 10 April 2007. ^ a b Karl R. DeRouen and Uk Heo. Civil wars of the world: major conflicts since World War II. 1. ABC-CLIO. p. 743. ^ What's happening in Sudan?, Sudanese Australian Integrated Learning (SAIL) Program. Archived 27 December 2005 on the Internet Archive. Retrieved 10 April 2007. ^ Cascão, Ana Elisa (4 August 2017). Magnólia Dias, Alexandra (ed.). State and Societal Challenges in the Horn of Africa : Conflict and processes of state formation, reconfiguration and disintegration. ebook'IS. Lisboa: Centro de Estudos Internacionais. pp. 143–165. ISBN 9789898862471. ^ "More than 3,000 killed in South Sudan ethnic violence, says Pibor official - Sudan Tribune: Plural news and views on Sudan". www.sudantribune.com. Retrieved 28 May 2018. ^ Karl R. DeRouen and Uk Heo. Civil wars of the world: major conflicts since World War II. 1. ABC-CLIO. p. 744. ^ a b c Brian Raftopoulos and Karin Alexander (2006). Peace in the balance: the crisis in the Sudan. African Minds. pp. 12–13. ^ a b Karl R. DeRouen and Uk Heo. Civil wars of the world: major conflicts since World War II. 1. ABC-CLIO. p. 745. ^ Sabit A. Alley, War and Genocide in the Sudan, iAbolish. Paper originally delivered at "The 19th Annual Holocaust and Genocide Program: Learning Through Experience" hosted by the Institute for Holocaust and Genocide Studies of Raritan Valley College in New Jersey on 17 March 2001. Archived 21 December 2005 on the Internet Archive. Retrieved 10 April 2007. ^ a b Brian Raftopoulos and Karin Alexander (2006). Peace in the balance: the crisis in the Sudan. African Minds. p. 19. ^ Johnson (2007), p. 209. ^ Prunier (2009), p. 133. ^ "'Africa's arms dump': following the trail of bullets in the Sudans". The Guardian. 2 October 2014. ^ Sudan – Foreign Military Assistance, Library of Congress Country Study (TOC), research completed June 1991. Retrieved 10 April 2007. ^ "A Deadly Love Triangle". Retrieved 8 November 2015. ^ Karl R. DeRouen and Uk Heo. Civil wars of the world: major conflicts since World War II. 1. ABC-CLIO. p. 742. ^ "SPLA to demobilize all child soldiers by end of the year". Sudan Tribune. Archived from the original on 15 February 2011. ^ Young, John (June 2007). "The White Army: An Introduction and Overview" (PDF). Small Arms Survey. Retrieved 30 December 2011. Bassil, Noah (2013). The Post-Colonial State and Civil War in Sudan: The Origins of Conflict in Darfur. London; New York City: I.B. Tauris. ISBN 978-1780760858. Connell, Dan (August 1998). "Sudan: Global Trade, Local Impact. Arms Transfers to all Sides in the Civil War in Sudan" (PDF). Human Rights Watch. 10 (4 (A)). de Waal, Alex (April 2007). "Sudan: international dimensions to the state and its crisis" (PDF). Occasional Papers (Crisis States Research Centre) (2). ISSN 1753-3082. Johnson, Douglas Hamilton (2007) [1st pub. 2003]. The Root Causes of Sudan's Civil Wars (4th ed.). Oxford, Kampala, Nairobi: International African Institute. Leopold, Mark (2001). "'Trying to Hold Things Together?' International NGOs caught up in an Emergency in North-Western Uganda, 1996–97". In Ondine Barrow; Michael Jennings (eds.). The Charitable Impulse: NGOs & Development in East & North-East Africa. Oxford, Bloomfield: James Curry Ltd; Kumarian Press. pp. 94–108. Prunier, Gérard (July 2004). "Rebel Movements and Proxy Warfare: Uganda, Sudan and the Congo (1986-99)". African Affairs. 103 (412): 359–383. JSTOR 3518562. Plaut, Martin (2016). Understanding Eritrea: Inside Africa's Most Repressive State. Oxford: Oxford University Press. Vuylsteke, Sarah (December 2018). "Identity and Self-determination: The Fertit Opposition in South Sudan" (PDF). HSBA Briefing Paper. Geneva: Small Arms Survey. Bishop calls for Churchwide day of prayer and fasting for an end to Sudan violence on 26 June 2011 – leading up to 9 July expected day of new independence for the Southern Sudan.